Ford Edge ST Overview | Donley Ford Lincoln of Mt. Vernon Inc. Most people have seen the Ford Edge ST in action. It’s an incredible SUV built for performance and reliability. You can see that the Edge ST is a combination of the comfort from the regular Edge as well as premium power and performance from higher trims in the Ford lineup. You’ll get a ton of power with the all-wheel drive Edge ST, which includes a twin-turbocharged V6 engine. 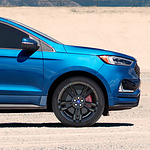 The design and handling are wonderful on the latest Ford Edge ST, which is what makes it such a great choice for anyone who wants to get an SUV but still works in the city or wants to go on long road trips on the weekends. If you are down for more hauling and adventure, then the Ford Edge ST is the greatest one you’ll see. Want to get into a Ford Edge ST? You can test drive at Donley Ford Lincoln of Mt. Vernon Inc. Schedule your appointment online today.